It’s well-known that Native Americans living across North America have struggled with alcohol addiction. These problems continue to this day and it is said that around 12% of deaths amongst Native Americans can be attributed either directly or indirectly to alcoholism. This fact applies to Native Americans living in America, Canada and Alaska. Native Americans living in Alaska are least likely to die as a direct or indirect result of their alcohol intake. The risks of developing alcoholism amongst Native Americans varies according to age, gender and tribe. Older Native American women are least likely to become afflicted by alcoholism. In fact, Native American women are less likely to abuse alcohol compared to the national average across all people living in North America. The male population are the highest at-risk group when it comes to alcohol-related deaths. One study analysed death certificates over a four-year period. This analysis revealed that Native Americans are four times more likely to die from alcohol-related illnesses or accidents compared to the general population across North America. This included road accidents caused by alcohol consumption and alcohol-inflicted illnesses such as liver disease. Native Americans are also more likely to experience non-fatal injuries and ailments as a result of their alcohol consumption. This includes muscle strains, sprains, visual and hearing problems, head injuries, bladder and kidney problems and poor dental health. Native Americans are also more at risk of being born with Fetal Alcohol Spectrum Disorder (FAS) compared to the general population. Native American babies are seven times more at risk of developing FAS compared to the national average. Native Americans are also much more at risk of abusing alcohol during their youth compared to the general population. Studies show around 80% of Native Americans use alcohol during their youth. It’s believed mental health issues such as poor self-esteem is the main cause of alcohol abuse amongst younger Native Americans. Before Europeans reached North America, it’s believed alcohol production was limited to the Southwestern region of the United States. During this period, Native Americans predominately produced alcohol for ceremonial purposes. Most of these beverages contained low amounts of alcohol (between 8-14%). The Apache, Maricopa and Pagago tribes produced wine from the saguaro cactus. In Texas, the Coahuiltecan tribe created alcoholic beverages by mixing agave plants with laurel. In the Eastern region of the United States, the Cherokee tribe produced alcoholic beverages by combining berries and fruits. Native Americans living in North America were unable to produce stronger alcohol concentrations during this period simply because advanced distillation techniques had not yet been discovered. This contrasted with Mexican Native Americans who were able to distil alcohol at over forty per cent from pineapple, honey or wild plum. Europeans had developed advanced distilling techniques during the centuries prior to colonialisation of North America. These alcohol-distilling techniques were developed over a long period of time, thus giving European populations the ability to develop legal, moral and social guidelines to moderate their use of this powerful drug. When Europeans colonialised North America, vast quantities of strong alcoholic beverages became available to Native Americans without giving them an opportunity to develop social and moral guidelines to moderate their use. Europeans utilised potent spirits and wines as a means of trading with Native Americans. 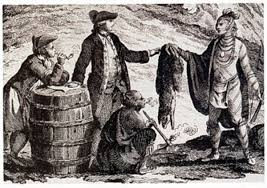 Distilled spirits were exchanged for animal skins and other precious resources. This created much demand for potent alcoholic-beverages amongst Native American tribes. Europeans discovered they could strengthen their hand in trade deals by intoxicating Native Americans with alcohol during negotiations. Europeans also drank during negotiations, but these people had, unlike their Native American counterparts, built up a tolerance to these potent spirits and wines. This trend continued as land was colonised from East to West. Miners, trappers and lumbermen all utilised alcohol as a means of weakening Native Americans ability to resist efforts to either steal or profit from their lands. It’s thus arguable that these historical factors could be a chief cause of the present-day problems Native Americans experience with alcohol abuse. When Europeans initially introduced potent forms of alcohol to Native Americans, it’s believed the Native Americans viewed excessive drunkenness as a “degradation to free men”. Most Native Americans only drank during trading negotiations or social events where Europeans were present. It’s believed drinking patterns amongst Native Americans grew exponentially over the following centuries of colonisation. Since 1975, alcohol consumption has remained constant amongst the Native American population. Alcohol distilling techniques amongst Native Americans originated in Central America. Knowledge of these techniques reached North America via Mexico. Alcohol was distilled from wild plants by Native Americans before European contact. However, alcohol was utilised for spiritual rituals and not for drunkenness. The idea of using alcohol for excessive drunkenness was unarguably a European invention. The Firewater myth states that Native Americans’ so-called ‘inability’ to handle alcohol is due to their inferiority as a race. The Firewater myth is a set of beliefs that Native Americans have a natural and genetic craving for alcohol and they are more likely to become belligerent when under alcohol’s influence because of this. This myth shifts culpability for alcoholism amongst Native Americans away from colonisation. In other words, this myth shifts blame away from white Americans’ ancestors and onto Native Americans themselves. This is clearly a form of victim-blaming. Studies have proven Native Americans are not genetically more susceptible to alcohol abuse, thus dispelling the beliefs that underpin the Firewater myth. Now that we have dispelled the Firewater myth, we shall now discuss factors that are likely to contribute towards the risks of alcohol abuse amongst Native Americans. The greater risks of developing alcoholism amongst Native American peoples is probably due to the multi-generational experience of trauma. The link between addiction and trauma is well established. Simply put, the more trauma you experience, the greater your risks of developing an addiction. Native Americans experience trauma for a variety of reasons. For instance, Native Americans are more at risk of having their families split apart by the state compared to the general population. This is unquestionably a traumatic experience for families concerned. Thousands of older Native Americans were forcibly removed from their families during their youth when the Governments of North America pursued a policy akin to cultural genocide. Decades ago, children of Native Americans were forced into boarding schools where they were not permitted to use their own language or even their own names. Also, around a quarter of Native Americans live below the poverty line. The rate of unemployment is double for Native Americans compared to the general population. Native Americans clearly must live with elevated levels of stress that are well above ‘average’. Stress hormones are known to suppress the immune system and mean Native Americans are much more at risk of developing chronic illnesses such as diabetes, liver disease and obesity. Suicide rates are also high amongst Native Americans. Native Americans are more at risk of becoming victims of alcoholism and alcohol-related deaths compared to the general population by a factor of 5.6. Native Americans are 3.9 times more at risk of developing chronic liver disease and cirrhosis due to alcohol consumption compared to the general population. Alcohol was a factor 69% of suicides amongst Native Americans. In 1980, this rate was 7.1 times higher. Native American males aged between 45 and 64 are particularly at risk of alcohol-related mortality. Native Americans are also more at risk of falling victim to domestic violence compared to the general population. This study found that 39 per cent of Native women reported that they were victims of intimate partner violence – a rate higher than any other race or ethnicity surveyed. Domestic violence has a devastating impact on families, individuals and communities. A major risk factor of domestic violence is substance abuse, including alcoholism. Native American babies are at a higher risk of developing Fetal Alcohol Syndrome (FAS) compared to the general population in North America. Between 1981 to 1991 the risk of developing FAS was 31 babies per 10,000 amongst Native Americans, compared to just 2.1 per 10,000 amongst the overall US population. In fact, the prevalence of FAS amongst Native Americans is greater than anywhere else throughout the entire world. Contributory factors include high poverty levels and a lack of healthcare. Average spending on healthcare amongst Native Americans is just $2,782 compared to an average of $11,762 for those on Medicare. There have been a number of initiatives set up to assist Native Americans who may be negatively impacted by the issues we raise in this article. The Indian Health Service set up the Alcohol and Substance Abuse Programme (ASAP). The ASAP assists both Alaska Natives and American Indians who are suffering from substance misuse. The ASAP is administered in tribal communities. Both inpatient and outpatient addiction treatment is made available for those who are covered under the Indian Health Service. The TAP coordinates resources and funding required to help mitigates levels of alcohol and substance abuse among the Native American population. If you are affected by any of these issues above, know that seeking out help is unarguably the best move you can make. Suffering alone will only serve to perpetuate your own or your loved one’s problems with alcohol.